The Astra hasn't sold well in the States, but that doesn't mean that its Euro-trash cousin can't make a comeback tour. Take a peak at the handsomely-designed 2010 Opel Astra and its agro-counterpart, the GTC. The current Opel Astra and its U.S. Saturn-based variant are getting a little long-in-the-tooth both in design and in driving dynamics when compared to its much newer rivals, the Ford Focus and VW Golf. The design will be in-line with current Opel design cues which began with the Opel Insignia and will ride on the new, larger Global Delta platform. These new cars will feature both a wider track and a longer wheelbase, allowing for an aggressive, well-proportioned stance. Also in store is a new estate 5-door model with a slightly longer wheelbase and increased rear interior storage. Also, pictured in sketch form is the high-performance 2010 Opel Astra GTC, which is poised to take on the new Ford Focus RS and VW GTI. Power will likely come from a version of the turbocharged, direct-injection 2.0L Ecotec featured in the Cobalt SS Turbo. The new GTC will trump the previous model's power numbers by about 20, totaling around 260-horsepower and 260 lb-ft of torque, while returning a rough highway estimate of 30 mpg. 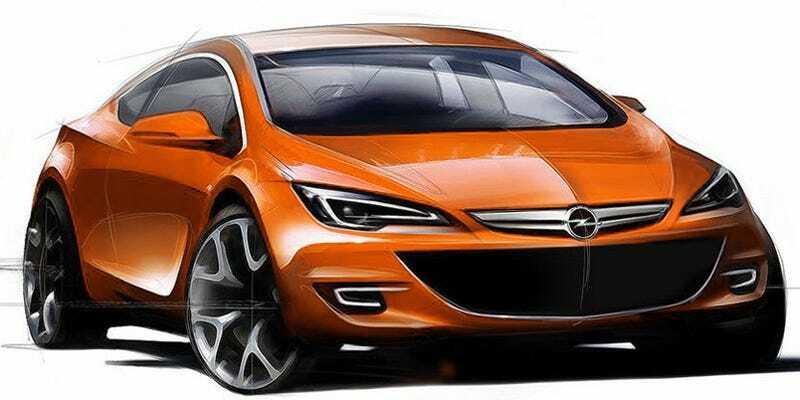 Will we ever have a chance at the new Astra? With current Saturn Astra sales not meeting initial expectations, it would be unlikely, but another small car in GM's lineup is just what the doctor ordered. It would make the perfect utilitarian choice over the Chevy Cruze and with the collapse of GM's U.S. performance operations, a Euro-tuned Astra GTC would fill the gap nicely. According to GM, we'll see the 5-door version at the Frankfurt Auto Show later this year. Luton. The next generation Vauxhall Astra will receive its premiere at next year's Frankfurt Show, delivering a compelling mix of technical innovation and groundbreaking design that promises to raise the bar in the compact sector. With its flowing lines and signature sculpted blade, the new Astra will carry the spirit of the Insignia into the compact class, offering customers a premium feel, while maintaining Vauxhall's value for money promise. Inside, the premium theme will continue, with a warm, wrap-around interior and a wing-line sweep that links the instrument panel to the door. An all-new chassis promises to maintain the Astra's reputation for class-leading dynamics, while new engines will maximise low-end torque to achieve miserly fuel consumption. Also expect to see clever and practical features on the new Astra, taking inspiration from systems like the Corsa's FlexFix integrated carrier. The new Astra will major on technical innovation, such as the Front Camera System used in the upcoming Insignia, which combines traffic sign recognition with a lane departure system, improving occupant safety and potentially helping drivers avoid fines. Next generation Adaptive Front Lighting (AFL) will also be shared with the Insignia. The system adapts to different road and driving conditions by providing nine unique light beams, improving visibility and safety during night-time driving. This will be the fourth generation of the hugely successful Astra, which has sold over 2.5 million cars in the UK during the last 27 years. The current model kick-started Vauxhall's design renaissance when it was launched in 2004, and according to Mark Adams, GM Europe's Vice President of Design, it presented his team with serious challenges: "The present Astra already combines a high level of technical substance and emotional styling, but with the new car we are taking a big step forward in both respects, while emphasising its sporting credentials."